One of the most important elements of modern, inbound marketing is the customer or buyer persona - because without a target, most of your marketing messages will miss the mark. If you are looking for the fastest way to sharpen up your marketing messages you need to get your head around the concept and value of buyer personas. Personas are essentially semi-fictional representations of your ideal customer based on market research, real data and informed guesswork. When creating your buyer persona(s), consider including customer demographics, behaviour patterns, motivations, and goals. The more detailed you are, the better. These personas allow you to really tailor your marketing communications to specific people through content that is relevant, emotive and a clear demonstration of how well you understand your customer, their pains and challenges. 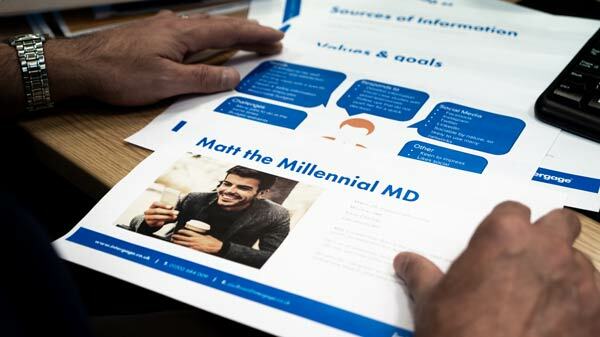 Your mission is to create clear and considered definitions of your buyer personas that allow you to connect both emotionally and logically with their needs, but this process should NOT be the sole responsibility of your marketing team. So, HOW do you go about creating buyer personas? You need to utilise the wealth of customer knowledge that already exists within every area of your company. There are many ways to develop a persona but leaving it all up to your marketing manager should not be one of them. You want your personas to have value to everyone in the business so the more people you involve in creating them, the better developed and more relevant they will be. Pick someone to be responsible for your personas – you will want to get everyone involved and incorporate as many viewpoints as possible, but you will need a single person to own the process and manage and maintain the personas. Get input from the whole company – customers interact with many different departments and individuals within your company, so get a full range of perspectives. Explore everything from the performance metrics of the marketing team through to sales data and the blueprint for a happy customer. Beyond your sales and customer service teams, speak to other teams such as finance to understand what makes the ideal customer for them. HOW are the personas developed? Understand your company’s purpose – you cannot develop personas and solve their problems if you are unsure of the problems your company is trying to solve and who might have those problems. Age, gender, role and responsibility? How can we best help this person? How could we really upset this person? Tone of voice to use? Search terms the persona might use? Involvement and responsibility during the decision-making process? Answer those questions – once you have defined the information that should form the basis of your personas you need to work through each question and provide an answer. Ideally you should apply both a quantitative and a qualitative methodology. Review your personas – share your new personas with everyone. Gauge opinion, gather feedback and look to get consensus. If there are still a few questions that you have not answered, use this wealth of opinion to make educated guesses and fill in the gaps. Over time you will continually review and update your personas but you need a solid starting point. WHAT do you do with your new personas? Get buy-in from EVERYONE – your personas will not truly transform your customer’s experiences with your company until they become an integral part of your company’s mindset. So, you have thoroughly defined personas and you are going to tailor all of your customer-facing efforts to these well-defined, ideal customers. This is seriously good progress and for some companies, it a point that they never seem to reach. Persona development is an integral part of an Inbound Marketing Strategy.